Registered dietitian Kristine Cuthrell warns that most Americans eat only 50 percent of the daily fiber they should, thus missing out on health benefits like lowered heart disease risks and better weight management. If you're looking to incorporate more fiber into your diet, several specific foods come recommended by doctors and nutritionists as the best fiber-rich options in the grocery store. Dr. Warren Enker, director of New York's GastroIntestinal Institute for Cancer and Continuum Cancer Centers, ranks dried beans at the top of his list of the top 20 fiber-rich foods. When it comes to bean types, black beans and kidney beans are the best. 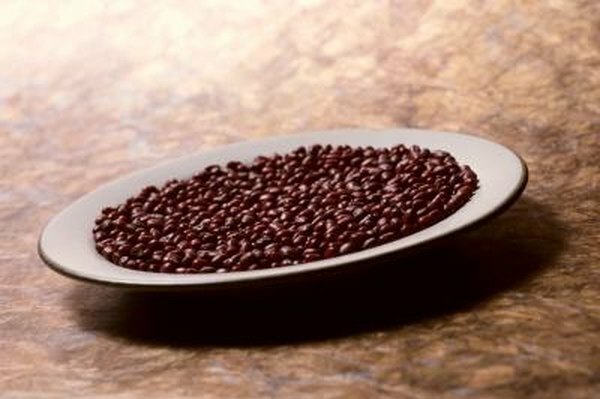 A cup of black beans nets you 15 grams of fiber, while the same amount of kidney beans gives you 13.1 grams of fiber. Berries, specifically raspberries, blackberries and strawberries, rank as the top three sources of fiber on Dr. William Sears' list of the top 10 fiber-rich foods available. A 100-calorie serving of these berry species provides 8 grams, 7.6 grams and 3.4 grams of fiber, respectively. Not only do the berries provide you with fiber, but they're also a rich source of antioxidants like vitamin C. Enjoy them plain, stirred into your low-fat yogurt or atop your cereal. When it comes to the top five foods that lower cholesterol, oatmeal is a nutriti8ous choice. That's because it's a high source of soluble fiber, which specifically helps with the reduction of low-density lipoprotein or LDL cholesterol. Eating just 1 1/2 cups of oatmeal for breakfast nets you 6 grams of this helpful fiber. Add some fruit to boost the fiber content even more, as well as add natural sweetness to the oatmeal. The National Institutes of Health sponsored a large medical study about fiber intake, published in 2011 in "Archives of Internal Medicine." Researchers followed almost 400,000 people for nine years, monitoring not just fiber intake, but also the food sources of the fiber that they ate. The researchers concluded that fiber derived from cereal grains, such as whole-wheat products and brown rice, provided the most health benefits when it comes to secondary fiber health benefits, such as reduced risk of death. Brans, specifically oat bran, wheat bran and rice bran, are healthy sources of dietary fiber. You can incorporate brans into your favorite baked goods, such as cookies, or eat them on their own as a snack or as a cereal. An ounce of oat bran gives you 12 grams of fiber, as does wheat bran; and an ounce of rice bran yields 6 grams of fiber. Corn comes in seventh among Dr. Enker's top 20 fiber-rich food recommendations. A 6-inch-long ear of corn on the cob provides 1.5 grams of fiber, plus high amounts of beneficial minerals like potassium. If you're into convenience, a 12 ounce can of corn generally nets you 4 grams of fiber. Eat more corn by sprinkling it on salads or adding it to soups. Papayas come in fifth on Dr. William Sears' list of the top 10 fiber-rich foods. A medium-sized papaya provides 5.5 grams of fiber. Other tropical fruits that provide a good dose of fiber include the starfruit, which provides 4 grams of fiber in a 1-cup serving; guava, which has 9 grams of fiber in every cup; and persimmons, which net you 6 grams of fiber per cup. Walnuts don't just contain fiber; they are also rich in polyunsaturated fatty acids, which helps boost the health of your cardiovascular system. In just seven walnuts, you'll find almost 2 grams of fiber. Apples are seventh on Dr. Sears' top 10 fiber sources. Thus, the saying an "apple a day keeps the doctor away" could actually prove true. In a typical average apple, you'll get 3.7 grams of healthy fiber. Much of the fiber is in the skin do don't peel the fruit before eating it. Ditch the pale iceberg lettuce and instead use more exotic, dark green vegetables in your salads and entrees. Examples include beet greens, which give you 4 grams of fiber in a cup; spinach, also at 4 grams; and the greens of mustard plants and turnip plants, which ring in at 5 grams.